We welcome an opportunity to create a UNIQUELY personalized item just for YOU. Are you looking for that PERFECT memento to commemorate a special occasion? Look no further! Give the gift that everyone can use. 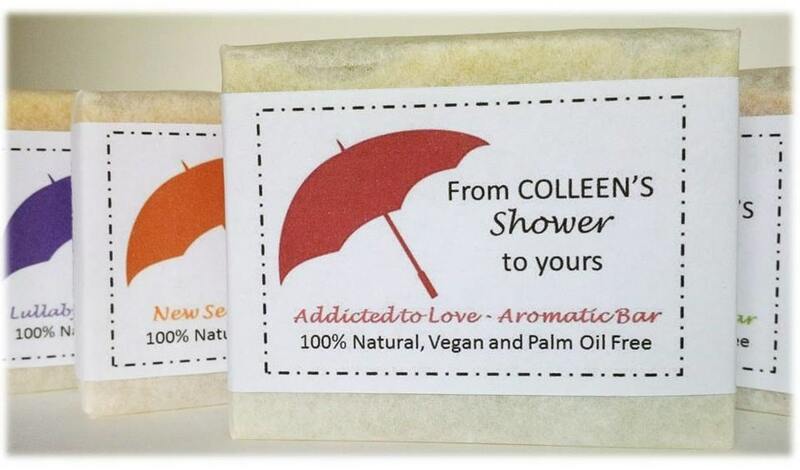 Our full-size and half-size soap bars with PERSONALIZED labels are GREAT as party favors. Handsome jute pouches and attractive organza bags are also available for a small additional fee. Contact us today for more information. We look forward to creating a personalized memento for your special occasion. Please Note: Our custom manufacturing process typically takes 6 – 8 weeks. However, if you need your personalized order sooner, we may be able to accommodate your schedule. Are you interested in purchasing wholesale soap for your store, boutique, spa or bed & breakfast? Our HANDMADE soap is 100% NATURAL, vegan, and palm oil free. Together, we can create a unique item that your customers will truly value and appreciate. Don’t just be different from the competition; offer something that promotes wellness AND contributes to your business’ success. Please Note: Our initial custom manufacturing process typically takes 6 – 8 weeks. However, if you need your customized order sooner, we may be able to accommodate your schedule.